Good morning! Jess here with my first solo post for the year! 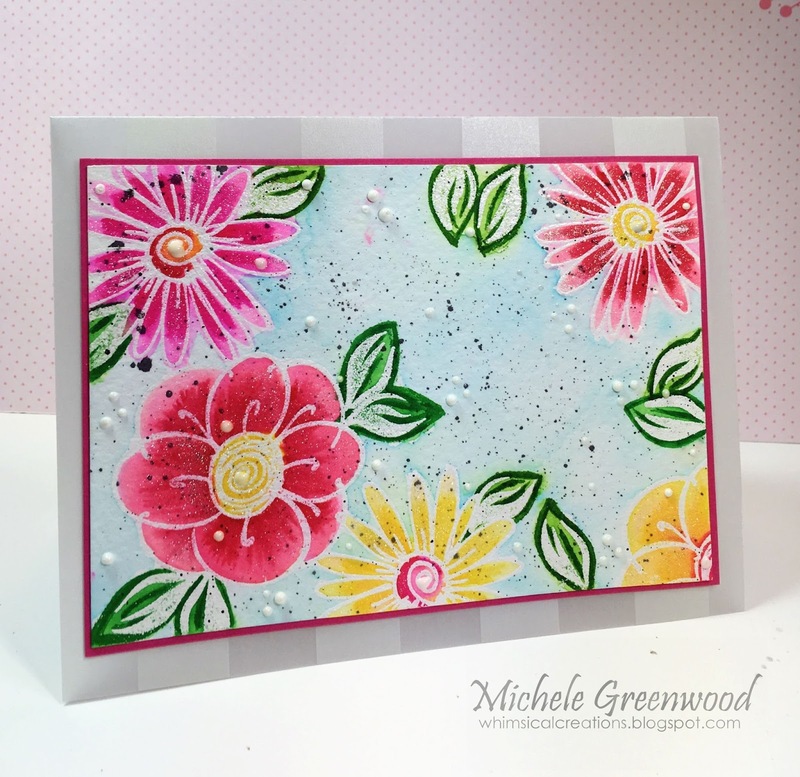 This month we’re collaborating with Right at Home stamps and I have a bright and cheerful card using two sets from Right at Home and Hero Arts that seem totally made for each other! Our challenge this month is to use or do something new to you! First off, I’m using new to me stamp sets (this is my first time using either set) and I’m also trying a new technique that I’ll explain later! 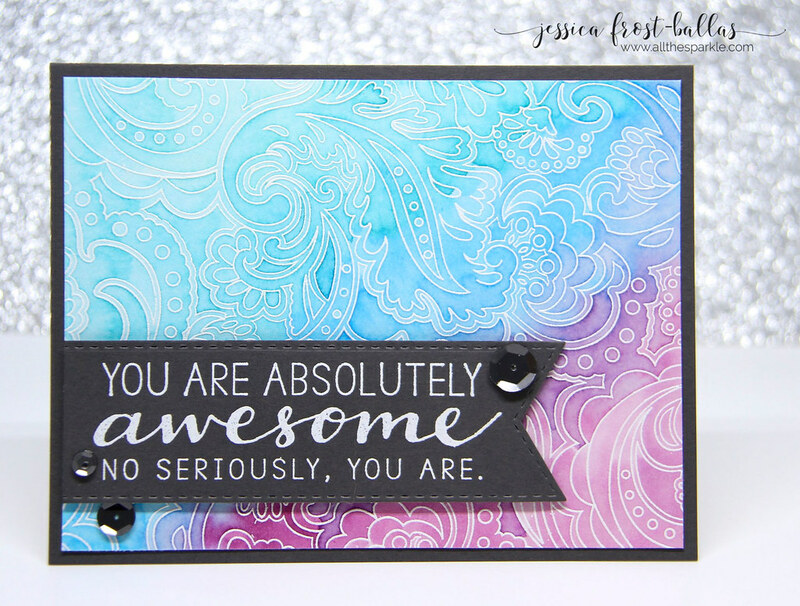 To start I stamped the sentiment from Right at Home onto watercolor paper with versafine and heat-embossed it with clear embossing powder. Then I inked the butterflies from Hero Arts with intense black ink, stamped them once onto scrap paper, and then stamped them again on my watercolor paper for a paler look. I added a little bit of shading with a grey zig clean color real brush marker and then blended it out using a spectrum noir clear sparkle brush. For the sentiment and one butterfly I added a little color to the edge and carefully used a damp paintbrush to blend it out. I’ve blended similar colors together before using my zigs but hadn’t tried the rainbow effect. I was pleasantly surprised that it wasn’t as difficult as I expected it to be as long as I kept my paintbrush just slightly damp instead of wet. In places where I didn’t have enough pigment I carefully added small lines of color to the edges and then immediately blended them out. I also made sure to rinse out my paintbrush between warm and cool colors. After I was satisfied with the blending I added a layer of spectrum noir clear sparkle. 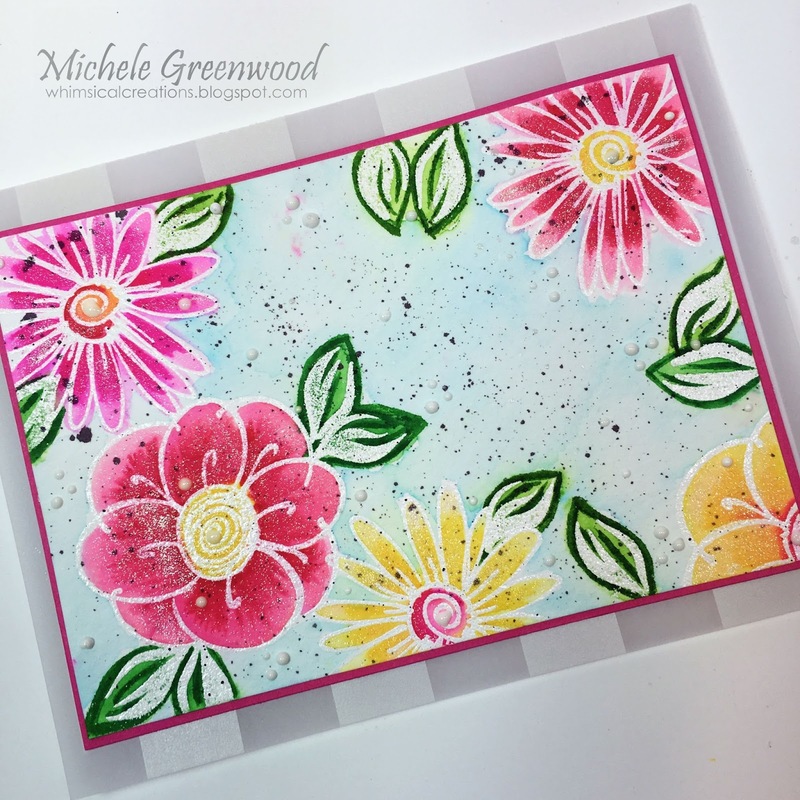 Don’t forget to play along with our New to Me Challenge for a chance to win a prize from Right at Home and many thanks to Right at Home and Nicole for collaborating with us this month! Thanks for visiting and have a wonderful day! Just a touch of gold! We are sponsored by the Ton this month and I am using gold metallic sequins and a gold word die for my pop of color! 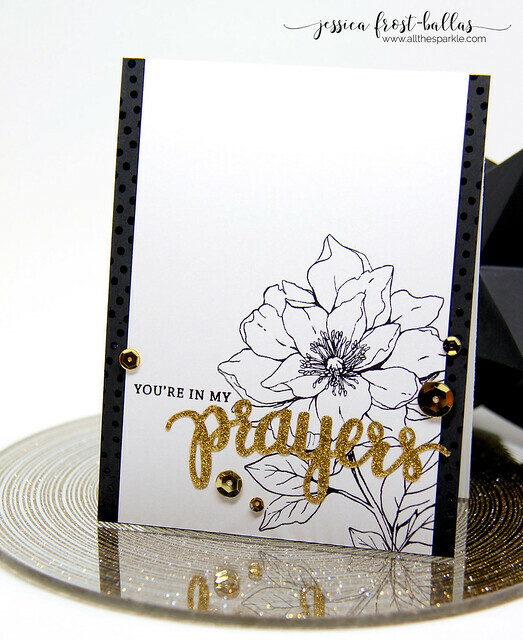 I wanted to keep the rest of my card in black and white to allow the gold to really shine. Plus it’s the Olympics so gold is on everyone’s mind! 😉 So to start I stamped my peony on white cardstock and masked it so I could stamp the stem and leaves. Then I stamped half of the sentiment in black ink and die-cut the rest of the sentiment from gold glitter paper. I trimmed that panel down to 3.75″ by 5.5″. 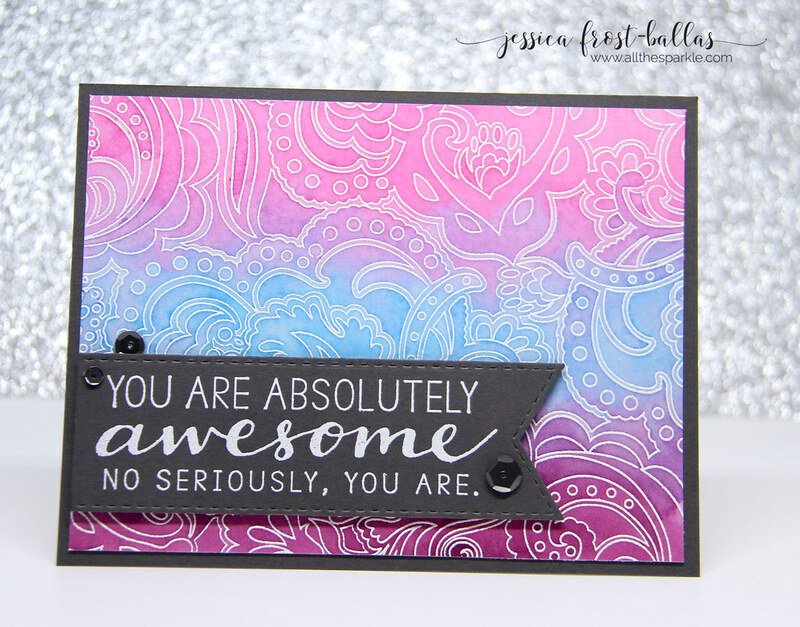 Next I stamped the moire background stamp onto black cardstock with versamark. 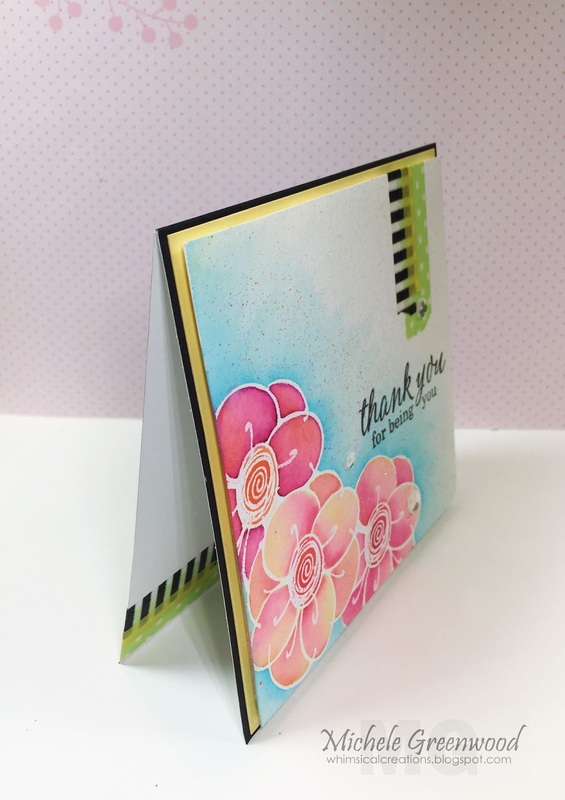 I heat-embossed it with clear embossing powder and then adhered the peony panel on top. I adhered that to a white card base and finished it off with a sprinkling of Metallic gold sequins from the Ton. And that’s my card! 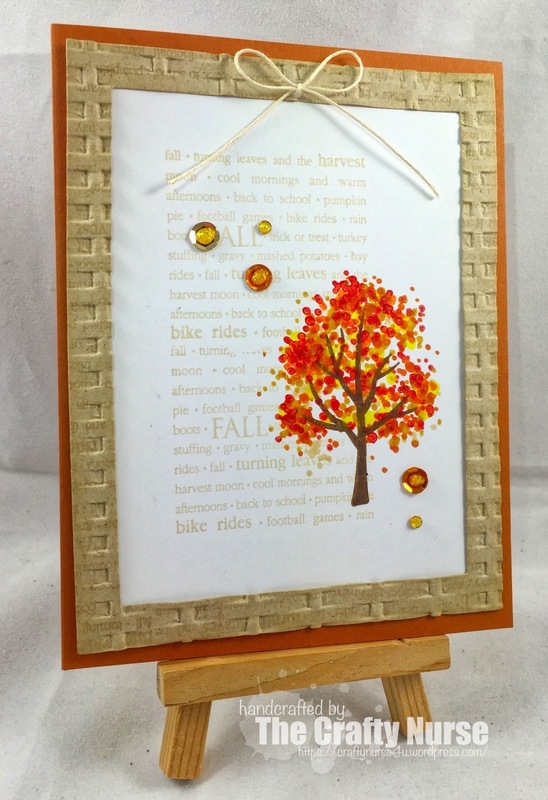 I can’t wait to see how you incorporate a pop of color into your cards this month! Good evening! 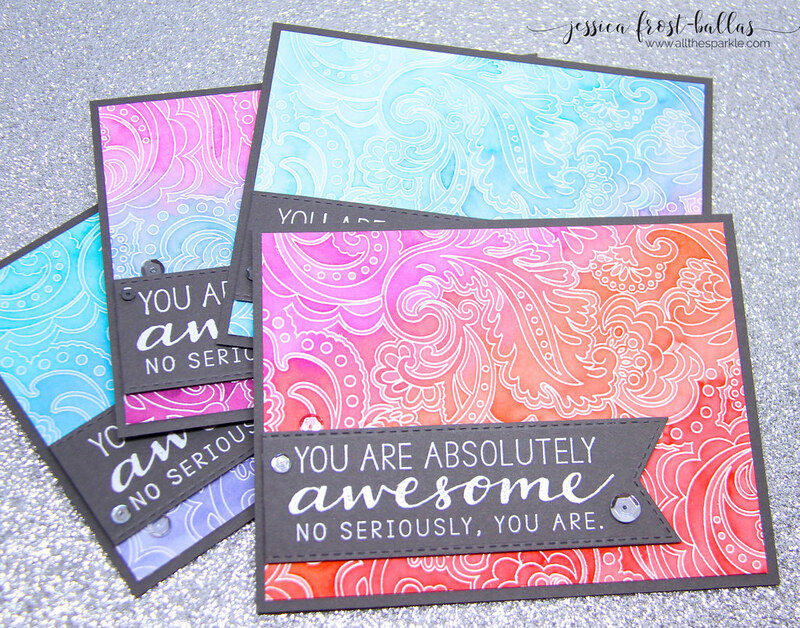 Jess here with a set of colorful encouragement cards! 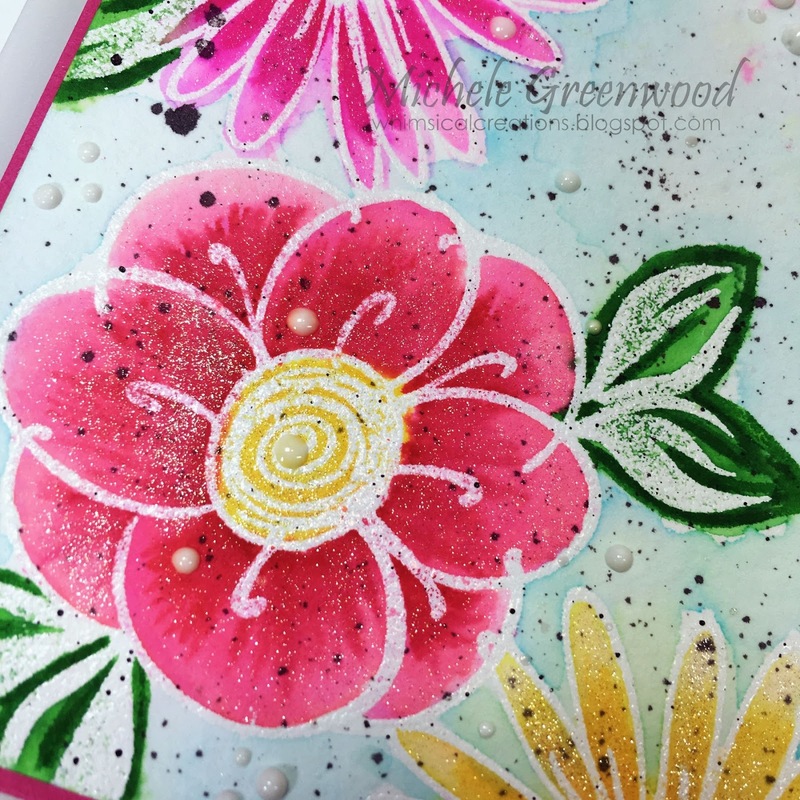 To start off, I have to apologize…generally I try not to use products that are discontinued or retired; however, I’ve been searching for this background stamp for almost a year and finally found it! I just couldn’t help myself, I had to use it! 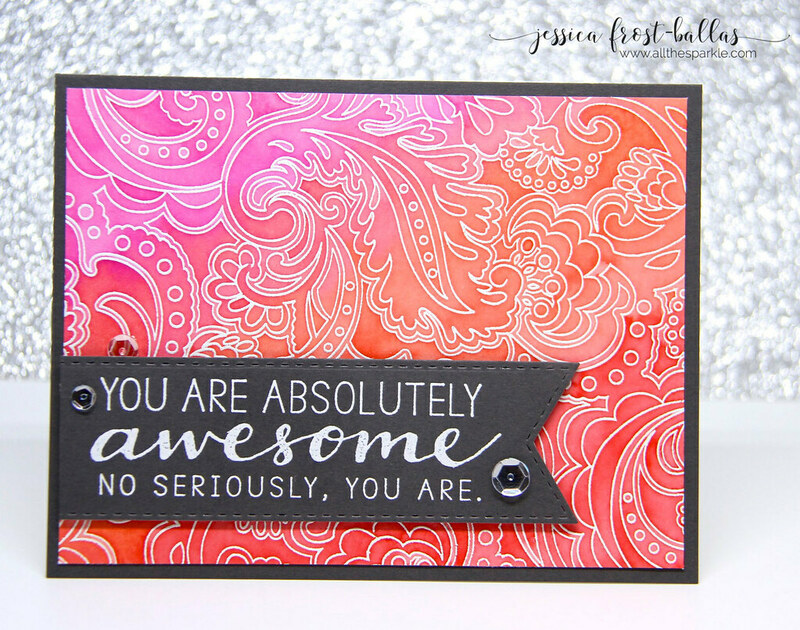 However, you could easily replicate this look with any of the fabulous background stamps that Hero Arts carries! While those were drying I worked on the rest of the card. First I die-cut fishtail banners with grey cardstock. I like using grey cardstock instead of black for a softer look! 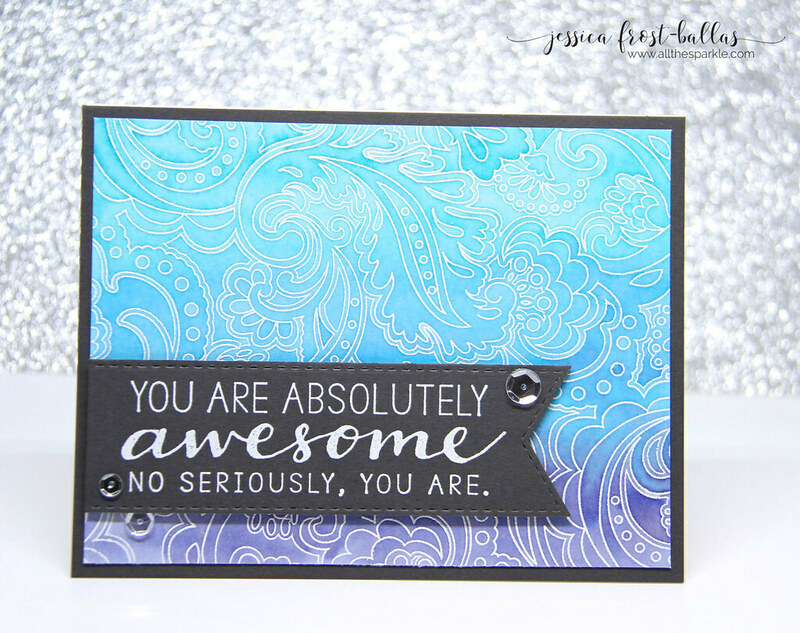 Next I stamped the sentiment with versamark and heat-embossed it with white embossing powder. Once the watercolor panels were dry I trimmed them down to 4″ by 5.25″ and adhered them to a grey cardstock base. I used foam mounting tape to add the sentiment banners and finished the cards with sparkling clear or dark grey sequins! 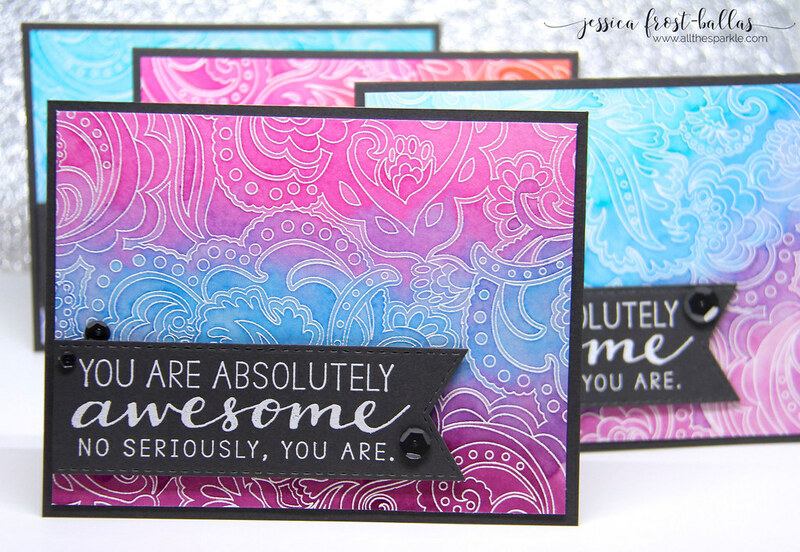 I just loved using this background stamp and I am so happy that I finally found it…if I hadn’t run out of time I probably could have easily made 50 more! I hope you enjoyed my set of cards and I’d love to know if there’s a long-lost stamp on your wish list! 😉 Thanks so much for visiting! Sponsored by the fabulous Newton’s Nook!